Wash the eggplants. Remove the stems, and cut length-wise into slices not thicker than 1/4-in. Place the slices on a large platter, slightly on an angle. Sprinkle them with salt, place a weight on top, and let stand for about one hour. In the meantime, brown the onion and the garlic in oil over a very low flame, and then add the tomatoes and let simmer for about 1/2 hour, stirring frequently. When this is done, pass through a sieve and add a pinch of salt. Cut the Mozzarella into very thin slices and let them dry on a cloth. Chop the basil and mix it with Parmigiano. Wash the salt off the eggplant and dry them. Dredge in flour and fry in very hot oil. Turn them to brown and when both side are done, lift them out and drain on a paper towel. Pre-heat the oven to 375ºF. 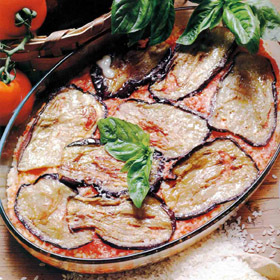 Coat a deep baking dish with olive oil and put in a layer of eggplant. Sprinkle with Parmigiano, pour on a layer of tomato sauce, and cover with slices of Mozzarella. Repeat this layering until all the ingredients have been used, and then cover with tomato sauce, sprinkle with more grated Parmigiano and bake for about 30 mins. This dish is very good hot or at room temperature and makes a good antipasto. Zucchine alla parmigiana can be made in the same way, substituting zucchini for eggplant.